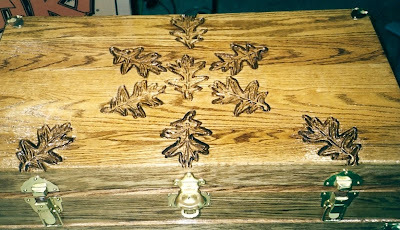 This steamer trunk, embellished with hand-carved oak leaves, is constructed of oak and lined with cedar. Leather handles complete the hardware. 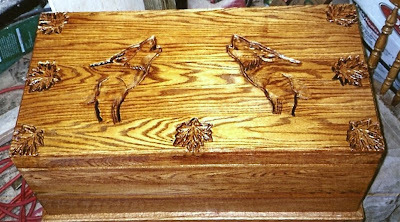 This steamer trunk, hand carved with howling wolf profiles and maple leaves, is constructed of oak and lined with cedar. Brass hinges and clasps will be added, along with leather handles. 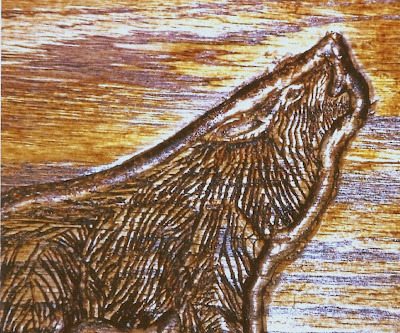 Detailed hand-tooled carvings such as this howling wolf adorn the trunks fashioned by Steve in his shop.